MANCHESTER CITY BOSS Pep Guardiola backs Thierry Henry to become a manager — if that is something the former striker wants to do. Arsenal lost perhaps their best chance at silverware this season with a humiliating 3-0 loss in the Carabao Cup final to Man City on Sunday, then fell further out of the top-four race with another loss to City by an identical scoreline four days later. The defeat heaped further pressure on Gunners boss Arsene Wenger, as Arsenal remain 10 points back from fourth place with the Europa League looking the only possible route back to the Champions League. An Arsenal legend, Henry’s name has been floated by pundits as a possible replacement for Wenger as the London’s club finds their season falling apart. 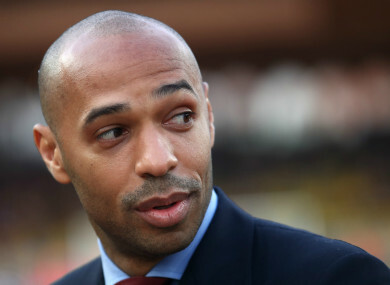 Currently an assistant under Roberto Martinez with the Belgium national team, Henry has previously said it is his “dream” to manage Arsenal. And he has a believer in his former manager at Barcelona as Guardiola believes Henry has the ability to succeed, should he want to step into the coach’s box. In the meantime, Guardiola has sympathy for the Gunners’ current boss as Wenger’s side have now lost four of their last five games in all competitions, with their seven 2018 defeats more than any other Premier League club. But despite inflicting a second heavy defeat on Wenger in the space of five days, Guardiola spoke of his history with the under-fire Frenchman and the respect he has for him. “He knows my admiration of him,” Guardiola added. “We fight and play many times at Barcelona, Bayern Munich and here in the Premier League. While the heavy defeat certainly looked bad for Wenger and the Gunners, Guardiola singled out one moment in the second half as key. Arsenal, down 3-0 by half-time, were awarded a penalty in the second half after Nicolas Otamendi brought down Henrikh Mkhitaryan in the box. However, Ederson was there to make a diving stop on Pierre-Emerick Aubameyang’s spot-kick to deny the Gunners a foothold back into the match. And Guardiola praised his keeper for the stop, which helped him secure a victory in his 100th game as Man City manager. “If Ederson had not saved the penalty the game would have been completely open,” Guardiola said. With the victory, City now move 16 points above second place Manchester United in the table, as they march to what looks like a near-certain Premier League title. This week’s foreseen LOI postponements the right call, but what about last Friday night? Email “Guardiola backs Henry to enter management after Arsenal thrashing”. Feedback on “Guardiola backs Henry to enter management after Arsenal thrashing”.